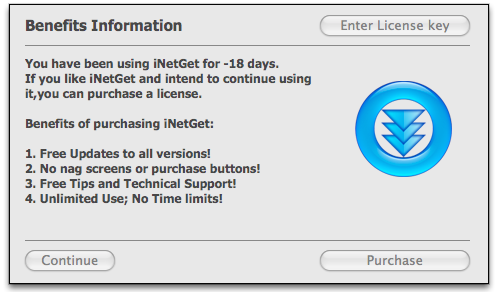 If you like iNetGet and intend to continue using it, you can purchase a license. 1. Free Updates to all versions! 2. No nag screens or purchase buttons! 3. Free Tips and Technical Support! 4. Unlimited Use; No Time limits! How to register iNetGet ? 1. Purchase an activate code. 2. Enter the activate code to register. 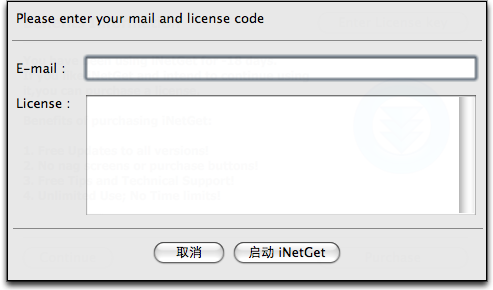 Just file your mail and paste the activate code that you have purchased, then click the button to register it.